Continuing to build on a close working relationship, Asmech recently supplied a rotary table and conveyor system. The system was integrated into a rotary filler and capping machine. The overall project was to supply a beverage manufacturer with a new bottling line. This line carried out each of the bottling processes. From blowing to filling, capping and labelling. Asmech designed, manufactured and supplied a conveyor system. 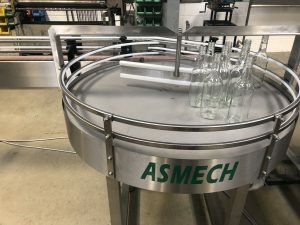 The conveyor would initially accept bottles on a rotary table, fitted with guides to ensure product is transferred onto the line in single file. Once the product has been singled, it is driven onto a slat conveyor. 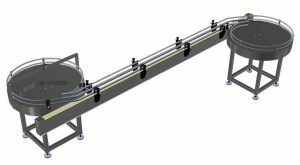 The slat conveyor then delivers product to the rotary filler and capping machine. At this point, we have an interface with the filler supplier. Product is passed between machines. It is then deposited back onto the slat conveyor when the filling and capping operation has been carried out. Bottles will then be conveyed onto a second rotary table. This will allow product to accumulate before being removed from the line. WANT TO DISCUSS YOUR PROJECT FURTHER? Whatever size of project, we work closely with our customers to identify all of your handling requirements before presenting our complete proposals. Our team will access individual requirements, to design and construct the most cost effective and highly efficient solution.